« Simpe tips to suspect secondary hypertension . 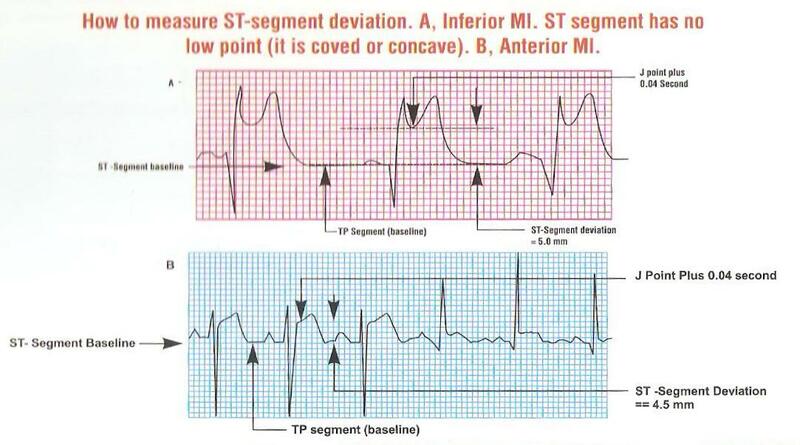 What is the reference point to measure ST elevation in STEMI ? ST segment elevation is the key parameter on which the fate of millions of infarct patients are recognised and managed. It is ironical we do not have standardised reference point for measuring the quantum of SR elevation . This is especially difficult when ST segment blends with forward limb of T waves. While we have reference point for measuring ST depression (Like during EST ). . . why we do not have one for ST elevation ? Now we have adopted a rough criteria .Read below . Measure The ST segment 40 ms from J point. ST segment elevation is the key parameter in ACS. Quantifying it becomes important in assessing the efficacy of reperfusion strategies and risk stratification. Fresh ST elevation can represent pericarditis, reinfarction or an early dyskinetic segment . Unless we have proper reference point there is a room for error in this simple parameter. Incidentally only after reading this did I realize what is meant by contiguous leads! BTW – Great blog and amazing for residents like me who are still new to Cardiology!